I’m a sucker for actiony thriller type books like these. You know the ones – renowned scholar goes on the hunt for Biblical artifact/tomb of mythical warrior/lost Shakespearean manuscript whilst thwarting armed assassins bent on stealing the aforementioned artifact/tomb/manuscript for themselves. What can I say? It’s a guilty pleasure. Trash reading while very possibly absorbing a little knowledge at the same time. Everybody wins. Pfft. That summary doesn’t really explain the book properly. Long story short, it is believed that Shakespeare’s original draft of Macbeth contained a terrible satanic write (‘A deede without a name…’) that Dr John Dee begged him to remove lest he accidentally conjure something terrible onstage. He does so and then, naturally, the original manuscript is lost. Believing that a demonic ritual gave Shakespeare his genius, modern-day baddies want to find the manuscript so they can reenact the ceremony themselves and enhance their minds to his level. Much better. The original summary doesn’t really mention how occult-centered the novel actually is. This isn’t your typical guns-and-explosions thriller (although both feature liberally); it’s much darker than that. Victims are often found having been violated during rituals and killers cast spells in an attempt to protect themselves. Despite Ms Carrell not having these beliefs herself, she seems remarkably respectful of true Wiccans. She never implies that their ceremonies are silly and subtly implies that the violence and brutality of her book’s Wiccans is not true to the huge majority of those out there. While I have to admit that I would have preferred a little less of the occult, it does have the advantage of making the book completely different to her first novel. 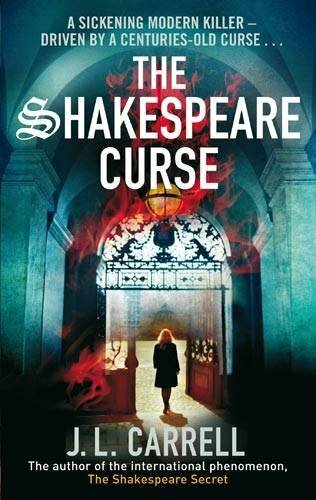 The Shakespeare Secret also features Kate Stanley hunting for a lost manuscript and I can’t really see how this one could possibly differ in any other way. I found the explanation of the ‘curse’ behind the play particularly clever. Theoretically, Macbeth still contains tiny bits of the demonic rites that were cut out and failure to complete the proper rituals in full brings down a curse upon the production. Whether that’s the true origin or not, I don’t know, but it’s a nice theory. Ms Carrell has obviously done her research. It’s a very entangled book, plot-wise – a few bits did make blink in confusion as there are many different characters, rituals and motives to keep track of. The notes at the back explain that the theories featured in the book are genuine scholarly concepts. 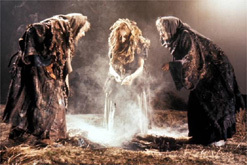 It’s thought by some that a different version of Macbeth really existed because of inconsistency regarding the witches. It’s also one of the shortest of his plays, leading to theories that it was considerably cut down to hide the more occult scenes. I also didn’t know that Shakespeare’s theatrical group, The King’s Men, contained men that were hand-picked by Sir Francis Walsingham, Queen Elizabeth’s spymaster, but nobody is quite sure why. I just wish these books didn’t feel the need to shove in badly-done romance with a trowel. The romantic interest features briefly at the beginning, is completely forgotten, and then pops up nicely at the end to tie up the story. Romantic entanglements are not necessary to write a book. Real-life people manage to function without them, why can’t fictional characters? I’ve loved the witches in Macbeth ever since I was part of a sketch during High School. I distinctly remember being Witch Two and perfecting my withered hag voice. I can still recite a large portion of the speech now, and frequently do so when the mood strikes!